When working with eTextiles on the body, we tend to need to access the textile (either used as a sensor or an actuator) wirelessly with a portable power supply. There are many solutions like bluetooth and Xbee / Zigbee, but they all have pro/con and limitations. 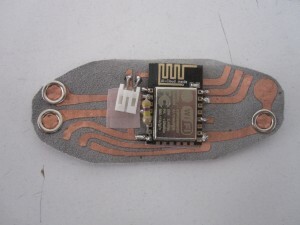 Recently we came across the ESP8266 modules. These IoT-chips are very cheap compared to other devices and use WiFi 802.11 b/g/n. In the focus-group “Go Small Go Wireless” we explored the ESP-01 and ESP-12 module. In this post we will explain the steps for setting up the with Arduino IDE, use the modules own ADC port and show the the workflow, so other eTextile practitioners can start using these chips.